Eagle Bulk Shipping is having a rough time in the market today, and for good reason. The company announced a reverse stock split. Today, we’ll talk about the reverse stock split, why these are often perceived as bad things, how the stock is reacting to the news, and what we can expect to see from EGLE moving forward. As mentioned above, Eagle Bulk Shipping is having a rough day in the market today after announcing a reverse stock split. The split will be a 1-for-20 under which investors will receive one share for every twenty shares owned. There were no fractional shares issued as a result of the reverse stock split. Instead, fractional share ownership was settled in cash. The split became effective as of 5:00 PM on August 4th, 2016. The reason for the split was relatively simple. For some time now, EGLE was not compliant with NASDAQ rules. The index has a requirement of stocks listed to maintain a $1.00 minimum average closing price. The move for EGLE to process a reverse stock split was a strong move given the circumstances. After all, if the company did not process the reverse stock split, it would have been kicked off of the index, which would have been overwhelmingly bad for the stock. Nonetheless, the reverse split isn’t necessarily the best thing either. At the end of the day, a reverse stock split is generally the last resort for companies to take. This move shows that the company simply couldn’t get the value of the stock up to compliance in any other way. Unfortunately, for many investors, reverse splits are a cosmetic move that is often perceived as an act of desperation. As investors, one of the first things that we learn is that the news moves the market. After all, the news moves the market. When positive news is released with regard to a publicly traded company, we can expect to see gains in the value of the stock associated with the news. 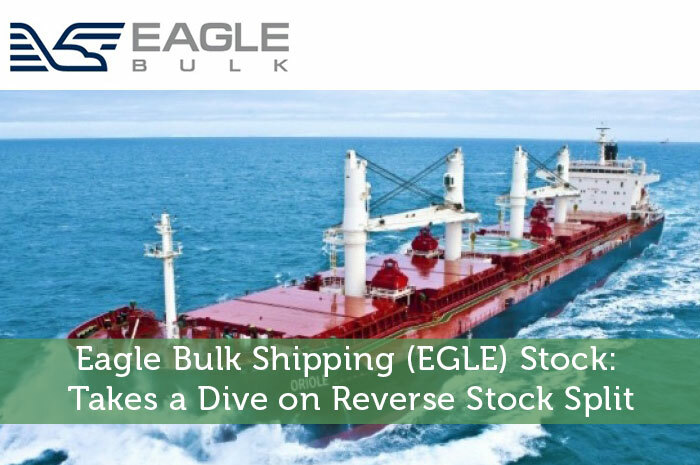 However, the news surrounding Eagle Bulk Shipping that was released today was viewed by investors as negative. As a result, we’re seeing declines in the value of the stock today. Currently (3:59), the stock is trading at $7.72 per share after a loss of $0.38 per share or 4.69% thus far today. Moving forward, I have a relatively mixed opinion of what we can expect to see from EGLE. At the end of the day, I believe that a lot of what we’re going to see moving forward depends on a big event on Monday. Monday, the company will be reporting earnings for the second quarter. If the report is positive, it will prove to be an incredibly strong sign. After all, the second quarter was poor on an economic scale. So, a strong performance could signal strong gains to come ahead. However, if we see a weak performance, I’m expecting to see further declines. Where do you think EGLE is headed moving forward and why? Join the discussion in the comments below!